Where do I use my Broadway Travel voucher code? There are a plethora of holidays available at Broadway Travel including all-inclusive breaks, city breaks, late holiday deals, family holidays, low deposit holidays, multi-centre holidays, winter sun holiday and summer sun holidays. All these getaways are available in top beach locations like the Balearic Islands, the Canary Islands, Cyprus, Greece, Madeira, Malta, Portugal and Spain, as well as popular cities such as Berlin, Budapest, Krakow, Lisbon, Marrakech, Prague, Rome and Venice. As well as holidays, Broadway Travel also provides cruises. They have multiple cruises to choose from including new annual cruises, all-inclusive cruises, Caribbean cruises, cruise deals, cruise holidays, MSC Cruises, NCL Cruises and Royal Caribbean cruises, so if you’re looking to sail away on a luxury vessel for a bit, you have plenty of options to choose from. As well as flights, hotels, holidays and cruises to locations all over the world, Broadway Travel also offers a number of travel services. These travel services include airport parking, airport lounges, airport hotels and travel insurance. Broadway Travel compare and book customers’ the best value and most trusted airport car parks and hotels across the UK, meaning you can enjoy a relaxed night right next to the airport so there’s no need for panic the morning of your holiday, and you can leave your car in a safe and secure location while you’re away. If you’d like to continue this pre-holiday relaxation once you check in you can book the best-priced airport lounges through Broadway Travel and unwind away from the noisy terminals before you fly. For peace and quiet on your getaway why not book an adult only holiday? The range of adult only options available at Broadway Travel feature hotels that are dedicated to adults, including exclusive facilities and features. Whether you’re looking for a secluded retreat or a stunning spa hotel, you’ll enjoy a distinctly kids free ambience at any one of these resorts, without paying any extra for these luxuries. Broadway Travel’s top adult only destinations include Crete, Majorca, Turkey, Zante, Gran Canaria and Tenerife. All of these popular beach locations are filled with great activities, plenty of gorgeous scenery and multiple stunning beaches. Whichever one you choose you can rest assured that your needs are met and can benefit from an affordable holiday with your friends or partner. Broadway Travel provides customers with a comprehensive range of travel insurance policies, giving you essential piece of mind. Their insurance supplier, First Travel Insurance specialises in travel insurance and have a passion for delivering the highest possible customer service. Together, Broadway Travel and First Travel Insurance aim to provide customers with a wide choice of travel insurance products including cover for single trips, annuals trips, long stay holidays and cruises, as well as an array of cover levels from Bronze to Platinum. Broadway Travel also offers cover for winter sports and sporting activities. 97 sports and activities are covered as standard and you also have the option to add on various extras at an additional premium. Offering multiple products means you can pick the policy that best suits your budget and requirements. All you have to do to retrieve a quote and ensure you have covered in the right place it to call Travel Interaction or use their online chat function. Find more information here. What documents do I need to take on holiday? Your final travel documents including vouchers will be sent to you 10-14 days prior to your departure date. It’s advised that you take your hotel voucher/s, flight tickets and boarding passes with you. If you have added any extras to your holidays such as transfers, car parking, travel insurance, airport lounges, excursions or car hire, you will also need to take these vouchers with you and present to the relevant supplier. All cancellation or amendment requests must be from the lead passenger only. If you would like to cancel your booking or any aspect of your holiday, please submit your request via the ‘My Booking’ system on the Broadway Travel website by selecting the ‘cancel order/passengers’ option from the drop-down menu and then selecting the relevant option. If you are cancelling your whole holiday, the system will calculate any applicable charges and confirm the cancellation. Founded over 70 years ago, Broadway Travel has been providing the best value deals on holidays and city breaks since 1948. 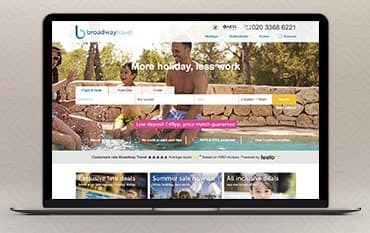 With decades of experience and partnerships with specially selected travel industry partners, you can rest assured that Broadway Travel can provide you with top quality, affordable holidays and an easy to use booking system. Book your holiday online with a Broadway Travel voucher code from us and save money on your getaway while enjoying a travel experience like no other in a popular beach or city location. Wherever you choose to go, you can book with absolute confidence that Broadway Travel is supplying you with a fully ATOL protected break. We are constantly on the hunt for Voucher Codes for Broadway Travel to help you with your money saving. Our experts check dozens of sites for secret codes including NHS discounts, student sites & social media channels saving you time & money!